Khambhalia is a city and a municipality in Dwarka district in the Indian state of Gujarat. 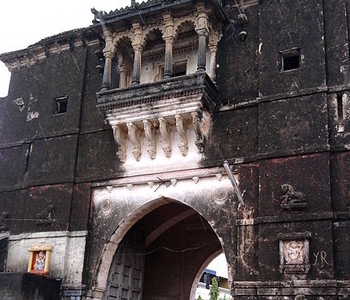 It is the headquarters and the biggest town in the Dwarka District.Khambhalia is a very old city with an old and still damaged partial Kille bandhi.There are some public places like Aradhna Dham (11 km away on the highway to Jamnagar), Ghee dam, Jadeshwar tekri, Khamnath (area in rivers way with some temples), Maa Khodiyar Mandir (Goddess temple). 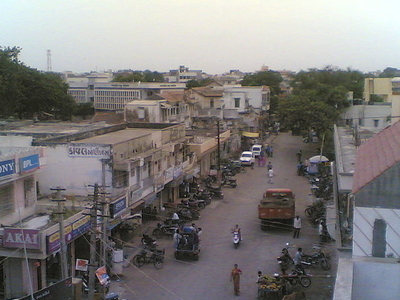 Nagar Gate, Jodhpur Gate, Satvara Choro and Darbar Gadh (Main market) Betk Road, Station road, Rajda Road, Char Rasta (four ways) are the main areas of the town. There is a temple called "Ramnath" in the outscirts of the town on the banks of the famous "Ghee Nadi", where every year fair is held during the last three days of holi month of Shravan. There is also a very famous place called Shiru Talao(Lake) where is a very ancient shiv temple is, and fair is held there once a year its a must visit since the biggest fair after Ranuja is being held there. The Khamnath temple is the oldest temple and it has been preserved in its old frame with utmost delicasy and lots of efforts by the citizens. Khambhalia is famous for ghee. Ghee is exported to various town and cities of whole India. Also the brinjals (aubergine) of khambhalia is very famous. There are 35 ground nut oil factories. This city's second name is 'Buttor City'.There are many big companies like Essar oil refinary Vadinar, Essar Gujarat Power Limited Salaya are also in Khambhalia. Here's the our members favorite photos of "Cities in Dwarka". Upload your photo of Khambhalia!